Toronto, Ontario, Canada: McClelland & Stewart, 1960. First Edition . Hardcover. Very Good/Very Good. 8vo - over 7¾" - 9¾" tall. SIGNED AND DATED BY AUTHOR, Fine black cloth. Very good green white black DJ. Some wear and tear, tiny chip DJ heel. (1960), 8vo, , 5-211pp. , New archival mylar cover included, SPADONI & DONNELLY 1535 (Spadoni notes 3 different color jackets no indication of priority), Hoy 4381 Modern Canadian English Prose, Watters p.603 A Checklist of Canadian Literature 1628-1960, Sutherland Barman Hale 150 History of Canadian Childhood and Youth A Bibliography. "In this new book Pierre Berton takes us behind the scenes for a look at this business of writing a daily newspaper column..."
Toronto: McCelland & Stewart, 1960. Fine but for traces of wear to spine tips, in jacket with some rubbing, closed tear in back panel, and a bit of sunfading to spine. Review copy with 3 pages of publisher's biographical info. laid in.. Signed by Author. First Printing of the First Edition. Hard Cover. Near Fine/Very Good. Toronto: McClelland and Stewart, 1960. Charcoal boards with a decorative stripe in light grey 1" down from the top edge and about 1 1/4 "wide.The authors signiture in red on the srtipe and the titles in red and light grey to the spine.The d.j. shows light shelf wear and there is slight creasing to the back top and bottom 1/4 ".A near fine clean book allround.. First Edition. Hard Cover. Near Fine/Very Good. Illus. by Illustrated with B/W Photographs. 8vo - over 7¾" - 9¾" tall. Toronto, : McClelland and Stewart,, 1960. 1st Edition . Hardcover. Near Fine/Very Good. 8vo - over 7¾ - 9¾" tall. Frank Newfeld . Orange DJ is not clipped, but has quite a few closed tears and general wear. (Spadoni notes 3 different color jackets no indication of priority), Table of Contents reads as follows : PROLOGUE : Conversation with a columnist,Twelve hundred words a day,The Hard Sell,The Twentieth Century,A Tourist in Moscow,Tintypes,Some unsociable Social Comment,True Lies,The Dear Dead Days Beyond Recall, EPILOGUE : The Best Known Columnist of His Day. "In this new book Pierre Berton takes us behind the scenes for a look at this business of writing a daily newspaper column." " Fine black cloth. A clean, unmarked copy! McClelland & Stewart, Toronto, 1960, first edition. 211 pp, large 8vo (9 3/16" H), hard cover in dust jacket. 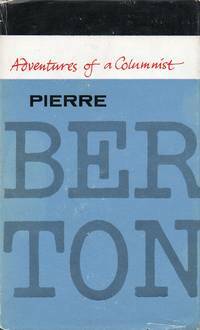 "Pierre Berton takes us behind the scenes for a look at this business of writing a daily newspaper column. It's a highly personalized account, to be sure, but one that is well calculated to entertain almost any reader. Included along with the author's personal comments is a varied selection of many of the best columns he has written over a two-year period. None of them has appeared before in book form." Very small light mark on page 121, tiny chip at bottom edge of free rear endpaper, slight darkening to top of textblock, very light edge wear. Dust jacket has several small closed tears - one with creases, light edge wear/wrinkling wear at top of spine and flap- folds has been colored with black ink, tiny chips at top of spine and top/bottom of flap-folds, light rubbing, minor soiling. Very Good/Very Good-. McClelland and Stewart, Toronto, 1960. Hardcover. Near Fine / Very Good Dustjacket. 211 pages, 6" x 9", gift inscription on ffep, edgewear on dustjacket, otherwise a clean and tight copy. Toronto: McClelland & Stewart, 1960. Book. Fine. Hardcover. First Edition. We believe this to be a first printing, but there is no price on the dj flap. Cloth. 211pp. Illus. Ink name/date on ffep. Fine in dj with some edge tears. Great essays by the eminent Canadian author..
Toronto: McClelland & Stewart, 1960. Hardcover book with dustjacket; dj has minor edgewear/fading, book itself is clean/tight/undamaged; 206 pages.. First Edition. McClelland & Stewart. Used - Good. Shows some signs of wear, and may have some markings on the inside. McClelland & Stewart, 1967. Mass Market Paperback. Good. Paperback. Sound & good copy, light to moderate rubbing/edgewear to wraps, name within. McClelland and Stewart Ltd. A fine red gilt stamped hardcover with a good dust jacket. Ex-library with pocket and slip attached to front free end page. Ink stamps on front free end page, the following page, and back end paper. Copyright 1960..
McClelland and Stewart. Used - Good. Shows some signs of wear, and may have some markings on the inside. Canadian Best-Seller Library #29 A very good plus paperback with black and white illustrations. 1967, first printing..
M & S, 1960 Hard Cover. Good/Good. McClelland and Stewart, 1960-01-01. Hardcover. Very Good. **No Dust Jacket**, lightly worn edges, some discoloration due to age, minor wear, perfectly readable and intact. McClelland and Stewart. Paperback. 108384 . Good. 1967. McClelland & Stewart A very good paperback. 1st edition 1967..
Toronto: McClelland & Stewart. Very Good in Very Good dust jacket. 1960. First Edition; First Printing. Hardcover. chip on dj spine top, bookplate on f.l.e.p. ;pencil name on dedication page . Toronto: McClelland & Stewart, 1960. Hardcover with dust jacket, 211 pages, black-and-white illustrations; book has just a hint of cover edge rubbing, ink signature on free front endpaper, but tight in binding, otherwise very clean and unmarked; DJ is intact, but chipped at edges and the top quarter of the front panel is missing.. First Edition. Hard Cover. Very Good +/Fair.